Hi! I received the press and it's now assembled. Just wanted to say fantastic job on crating, it was very secure in the crate. Thank you very much for the help along the way and keeping in communication with me. I will 1000% recommend your amazing place to anyone that is looking for a letterpress. I want you to know how very excited your craftsmanship has made me!!! I cannot wait to see her in action. I cannot wait for my workday to end so the real work can begin. I will let you know if I run into anything or have any questions. Thank you thank you thank you for making this day a most special day for me! Hello, I received the Cooks Victor in Korea yesterday. I was very impressed with the packaging. I think the work you did on the Victor is beautiful and I believe it will produce meticulous work as expected. I'm very grateful. I bought good equipment thanks to you. The press looks great. Its fun to see it restored so nicely. You have done a beautiful job. I got my press yesterday (4 X 6 Sigwalt) and I couldn’t be more happy with it! It’s awesome. The delivery was easy and smooth and the press arrived in perfect condition. You guys did an amazing job with packaging and attention to detail. Thank you so much for your time and the excellent product you sell. I did a test print and it worked perfectly. Again, thanks a lot for everything. I’ll recommend your business to any friend that might be interested in acquiring a printing press. Just uncrated the press. Amazing. Anticipation was high. And you still exceeded expectation. Tom, I certainly sense your aircraft level care in your work and attention to detail. Quality at its highest level. Again, artisan work and craftsmanship are obvious. Thank you for your care in its crating. Thank you. As I hoped and more. Beautifully documented. Obvious care and craftsmanship. We got the press! It is amazing, thank you so much! Your work is top notch! Will send some photos of prints once we pull a few. Just wanted to send the biggest thanks your way! I received and assembled the press today. I was blown away at how well crafted everything was, from the crate to the layout of the machine, your talents shined through. Your instructions were perfect and assembly was a lot of fun. I was blown away by the beauty of the press. My girlfriend and I are ecstatic about how it turned out and cannot wait to start printing with it. I almost have everything together so I can start very soon. Thank you for your excellent work in restoring my 6.5 X 10 O.S.Craftsmen Superior. The press is gorgeous and your service and attention to detail was amazing. Unpacking the press and setting it up was a breeze with the thorough instructions you provided. I would happily recommend your services to anyone looking to purchase a restored press. Again thank you both for your nice work on my Craftsmen. I will be happy to recommend you to all who inquire about the press. The parts arrived and they all turned out perfectly. Thanks again for taking such care to make them match- they fit as well as the originals. Thank you so much for everything. I really appreciate and was touched how much thought and and care went into it from the press to packaging to little details. Thank you so much for all of your work! We really need more people like you, so that the craft of letterpress could be passed on with excitement. Thank you guys once again. Wow... First off, let me just say thank you at the incredible job y'all have done. What y'all do is a true craft, and simply amazing. "Above and beyond" is the only way to put it. I cannot say thank you enough! She couldn't believe it when she saw it, and is so excited to start working with it! I can't say thank you enough... It's been a pleasure! My word, what a beauty. Truly speechless. THANK YOU so so much. Honored to have this piece of history that has been restored by you guys. What a transformation. The press is absolutely perfect. Thank you for documenting the process. It’s really awesome to see the hard work you all have put into it. Hopefully this will become one of many I can own by you guys. Letting you know the press arrived Friday. I got it unpacked and put together. Everything looks great! Your commitment and attention to every detail of the restoration is obvious...the press is beautiful! It's everything I hoped for and more. I especially loved the pictures of the restoration process. I'll be sending the crate back, probably tomorrow. From the minute you contacted me to the minute I left your house that evening, you were nothing but helpful and supportive. Your knowledge and expertise with tabletop printing presses is astounding and I truly was in awe while watching you get mine back into shape. Since my visit to your shop, I've had the smoothest performance of my press since buying it 12 years ago. I really cannot say enough great things about your work and I know where I am going to go to get my press completely redone. Just seeing the wonderful hand painting, the rehabilitation to the old parts, I feel lucky to be involved in this and to know such a wonderful resource exists. I hope you were able to work with the broken rocker and I am grateful to have found you or rather you find me through briar press. Wow! What a transformation. I received your pictures and the “new” platen looks great. I can’t thank you enough. 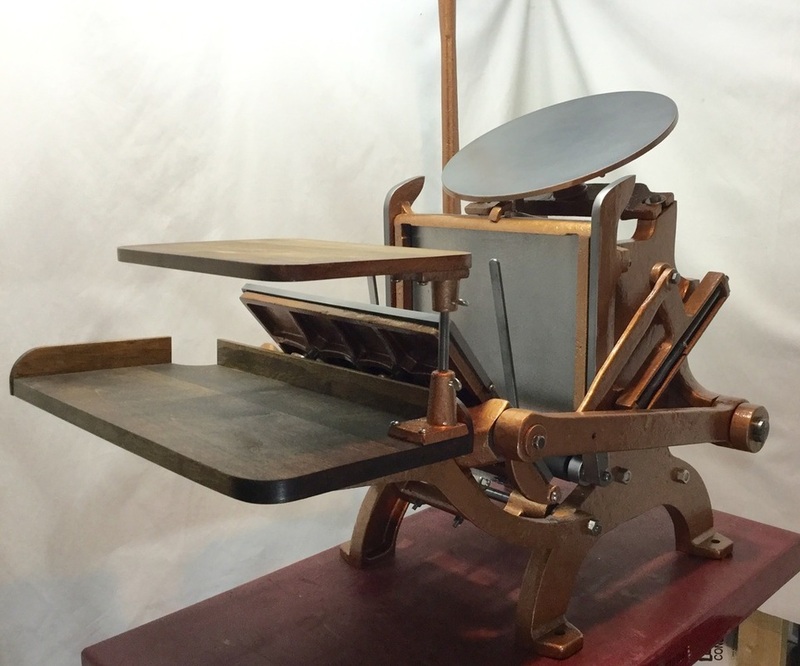 The press arrived in good condition yesterday. It looks even more stunning than I expected. I look forward to reading the literature you provided before I try printing for the first time. Thanks again for the wonderful work. It was certainly a pleasure working with you on this project and hopefully I'll have the opportunity to work with you again (another press in my future?)! Thank you so much for your hard work and extreme care. I will definitely (and have already) recommend you to other printer friends! The crate arrived yesterday in safety. It was big and heavy than I thought. But it packed really strongly, so the contents are not crack or broken. Finally the press actually appeared. It looks wonderful and perfect. I really love this beautiful press. Its coloring is perfect and clean. And the wood feed board is so lovely. I'm truly satisfied with my decision to buy this excellent press. Thank you so much again for your great work and effort. And thank you for the many furniture and reglets. I'm really happy with this gorgeous press like a band new. Thank you. WOW!! SHE IS SO GORGEOUS! Really, I'm in awe. That is one beautiful letterpress. Tom, I know you put a lot of work into making her right, and Terri, the paint and detail work is impeccable. The C&M is even better than I hoped. I want to have my hands on it, learning all about how to make it work. It looks like it was just made yesterday. It's amazing! Thank you both so much. The C&M will make me happy and busy and hopefully slightly artistic for years to come. The Pilot parts I ordered have arrived (Cooks Victor delivery board leg fabrication, 4 repaired Pilot chases, new Pilot impression screws with jam nuts, O.S. Pilot side frame repair and a brand new chase for the Cooks Victor). I am working on the Pilot right now. I can't thank you enough - everything turned out flawlessly and man, do you know how to pack a crate! Working with T & T Press Restoration was truly enjoyable. Terri and Tom provided excellent costumer service and a perfect product. The Pilot Press they restored for me works better than any I've operated so far and is sure to out-live me by a long shot. They were straight forward and kind throughout the whole process and helped me find the best press for my needs. I'm left now with an excellent machine and (just as importantly) a great relationship that I'll count on for a long time. I've received the press and finally today had the chance to unpack and assemble it. It looks wonderful and I'm very excited to use it! You did a terrific job restoring and putting it all together, its a beautiful piece of machinery. So far I haven't got any questions, but once I get a few more things together I'll print on it for the first time and let you know how that goes. Judging by the state of everything I assume it will be smooth sailing from then on. I've also reassembled the crate and will make arrangements with UPS come Monday. Thank you so much again for all your work and patience! I'm thrilled with it! I was new to letterpress when I discovered the platen on my newly acquired press was broken in two. After some Googling and searching on the internet I got in touch with T and T Press Restoration and decided to ship the platen to them for some TLC. I am so happy I did. They kept me well informed with what needed to be done, and with each progression of the repair. I get the impression that restoring old presses truly is a labor of love at T and T Press Restoration and I feel like they afforded the same attention and care to my little platen. The platen is now back in its rightful place and happily printing away like nothing ever happened. Many thanks T and T Press Restoration. I would recommend you to anyone. I'm so happy the internet helped me find you. I'm not sure I could have got it fixed anywhere near where I live! We are very satisfied with our new press, you did really wonderful job. Also, your package was perfect and very thoughtful. We were very impressed. Thank you very much for your care. I am extremely happy with the end result of all your labors. Thank you so much, it's really a possession I will treasure for my whole life. I can't say enough wonderful things about your craftsmanship, courtesy, and professionalism... from start to finish: you all are a joy to work with. I appreciate it more than I can possibly express in an email. We opted to keep the crate and use it as the table since the press was already mounted so well to the crate bottom. You did an insanely great job of packing the press, wow! Again, Thanks a million! I received the press really fast. The press is perfect. I recommend this vendor. Thanks for fast, professional transaction. The press and crate are perfect.